We are a leading Manufacturer of star washer from Ahmedabad, India. We present our clients with an innovative range of Star Washers that are manufactured in accordance with the prevailing market standards. 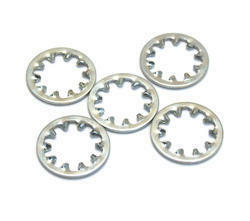 Based on modern technology and designing, these Star Washers are highly demanded in the host of industries. Furthermore, these round star washers are known for their high tensile strength, durable finishing, and anti-corrosive properties. Looking for Star Washer ?